Following his performance in Atlanta, Ga. on July 14, 18-year-old Santa Clara Vanguard euphonium player, James Williford, talked with DCI.org's Christina Mavroudis about marching in his first year with the Vanguard and about some of the corps' traditions. 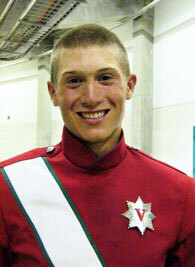 CM: Why did you choose to march with the Santa Clara Vanguard? JW: I marched with the Vanguard Cadets last year, and I love the tradition, the spirit of the corps and just everything about Vanguard. It's just a beautiful corps and organization with great people. We play music that's really emotional and really heartfelt, and I love all of it. It's all about passion, devotion and tradition, and it's amazing. CM: Tell me what the corps' song "Send in the Clowns" means to you? JW: Last year, I didn't really know the meaning behind it, but as I heard it more and more, I started to understand it, and now it brings tears to my eyes. We lost the corps' founder Gail Royer but we still push forward knowing that his spirit still lives on. I love playing "Clowns" because the euphoniums get to start it and end it. It's just an amazing song. CM: Is it difficult to march with the euphonium? JW: It was a pain earlier in the season because of the intrument's size and weight, but I think it's actually a love/hate relationship. I started to accept the fact that it's going to hurt all season, but I also learned to love it. We can definitely snap the horn up just as hard as any soprano player. CM: Do you ever feel like the pain might be too overbearing during a show? JW: Not really, the adrenaline really kicks in right before that happens and the pain just goes away. Then when I come off the field, I put my horn at a carry and my back doesn't hurt anymore. CM: What are your plans for the future after this summer? JW: I want to march here for the next four years until I "age-out" in 2010. Right now I'm going to a community college, but I eventually want to teach music and maybe come back and teach Vanguard. CM: How is it being a member of the corps during Santa Clara Vanguard's 40th Anniversary? JW: It's a trip and it's really cool. I thought last year was cool, but this year is really great. We've got good music, good drill, and all this tradition in the show; it's just been an amazing year so far. CM: Tell me about the traditional bottle dance that's in your show. JW: We put that dance movement in the ballad since we really wanted to put as much tradition into this show as we could. The corps hasn't done this in a long time. We thought it would be really cool if the horn line did it instead of the guard, and the effect of it is great and it's so much fun to do.